Not everyone can bring in a facilitator to lead their group through a full or half day of activities and insights to improve team communication and cohesiveness. As a high school coach, I eventually realized that team culture was far more impactful than the X's and O's. And it was my frustration with not being able to find an affordable event facilitator to work with my team that eventually led to my own interest in becoming a team building speaker. While I very much enjoy working with corporate groups and university athletic programs, I do realize that there are hundreds of coaches who are searching, just like I was, for easy team building activities that can be used to develop team chemistry. And, if you are working with a young group of athletes in a youth league or as part of a high school program that you want to inspire to work better together, I would like to suggest two other fun activities that may be helpful. First, let me emphasize the importance of paired teammate interviews. Have your people pair up and interview each other asking questions that provide opportunities for everyone in your group to share information about themselves. An evening of teammate interviews and sharing responses can be a fun and influential time together. The more your teammates know about each other, the more they will care for and understand the why behind teammate behaviors – and if they feel their teammates care about them, they are more willing to be held accountable for their efforts and contributions. Some of your group may be very familiar and already have strong connections – but it is the new connections and creation of new bonds you want to focus on. Instead of allowing them to pair up according to their own comfortable existing relationships, take the time to pair up your team so that the individuals who NEED to know each other better and create a stronger bond have the chance to talk and share information. Give each person a pen and a piece of paper with 5-6 questions they will ask their partner. Give the pairs about 15 minutes to interview each other, and then have them share the funniest answers when they come back together as a group. What cartoon character are you most like, and why? Have you ever cried while watching a movie? If so, what movie? It will take around an hour to have each partner share information from the interview, but it will bring out a lot of laughter, and will open doors for future conversations between your teammates that otherwise would not have occurred. The second easy team building activity is disappearing chairs. It is less time consuming, but perhaps an even more useful tool to develop team chemistry, and is a powerful illustration of how we need to lean on and support others as teammates. You will need four armless chairs. The activity is simple. You can find a short video here to watch. With the four participants seated, you ask them to lay back into the lap of their teammate. And then you will remove one of the chairs. This requires the person to be supported by their teammates. After a moment or two, you then remove a second chair. Then remove a third chair. Then remove the last chair, so that all participants are supporting each other. You can count, and challenge the teammates to remain as they are, supporting each other without chairs, for at least 30 seconds (or even a full minute!). The key is for them to experience the feeling, and then follow up the initial example by allowing every member of the team to have the same experience. Finally, the most important part of the team building activity is your debriefing discussion. Who lasted the longest? Why? How is this a great lesson on leadership or teamwork? How does it relate to our team goals? Who or what are the chairs for our team? It is the discussion and shared conversation that come after the experience that truly make it a valuable activity – for the intent is to have your group recognize and remember the experience and important of supporting, and being supported by, their teammates. Obviously, there are hundreds of other team building ideas you could find to develop team chemistry – but the most important part of choosing your activities is the focus on finding ways to have them interact and share information to build stronger bonds, and then to emphasize and have them internalize lessons that will make them more successful (such as learning the significance of supporting others in adversity). If you are interested in learning more, I encourage you to visit my website for more team building resources. And if ever you need more than a few do-it-yourself ideas, I am available as a team building speaker to inspire your group at a banquet or conference with an interactive message to improve your group’s morale, awareness, and leadership skills. Lead your team to a successful season. Help your people to enjoy the journey and learn more about themselves and their teammates while teaching things that are more important than just strategy. Focus on developing team chemistry. What do you think? Let us know by leaving your comments, suggestions, and questions. . . This is fantastic. Team building is often neglected and, especially when players are together for more than one year, you really need to pay attention to relationships within the team. I love it, positive social skills makes life more enjoyable for all. Thank you. I love the chair weaving of bodies. This is a great trust activity for the kids to participate in. Thank you very much for the ideas. I really appreciate both suggestions, and I could easily see both activities taking place during a Friday night after a tough practice. Have team go home, shower, and come back to gym, or coaches house, or whatever for some pizza and team building activities. 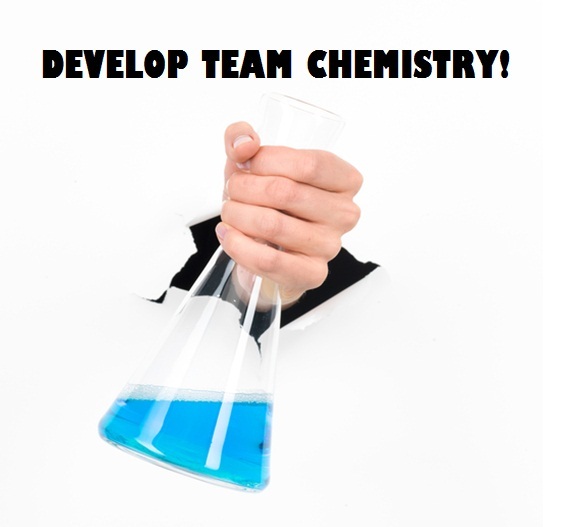 I agree with previous posters that team building is often neglected; it almost seems to me that teams "building chemistry" should just happen naturally. Sure, to a certain extent, this will happen as your team goes to battle together during the season. However, activities like these, especially early in the season, can really foster growth on a different, more impactful level. I am part of a basketball league and I will admit that our team hasn't done well so far! It is baffling, though, because our team is full of talented individuals. I think that we need to do some team building activities. These are fun ideas that I will try. Thanks! Disappearing chairs. This activity can be done with many more participants. Imagine 30 people that end up in one big circle with no more chairs. You can have them move forward in unison. Takes a lot of communication and collaboration. I liked that you pointed out that having some fun get to know you questions. I liked your suggestion of asking what cartoon character are you most like. That seems like a fun question for everyone. That could also lighten the mood for when you are team building as well.